St. John's South - Mount Pearl's Member of Parliament, Seamus O'Regan, introducing Sheldon Levy. 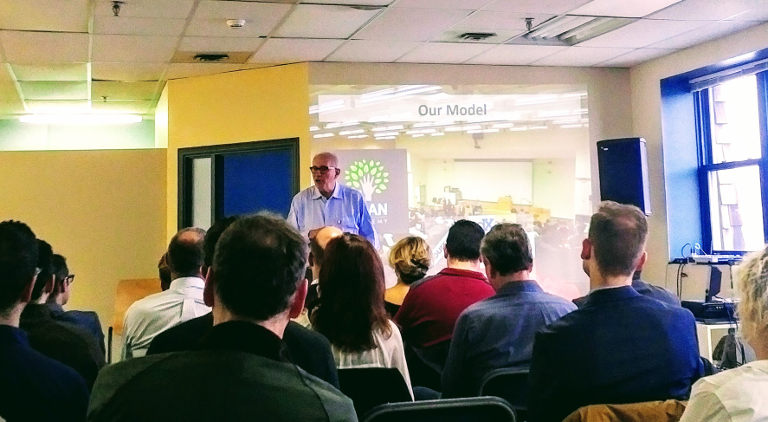 Sheldon Levy was in town Saturday at the invitation of Seamus O’Regan (Member of Parliament) and Dr. Gary Kachanoski (Memorial University President) to talk about driving innovation and entrepreneurship. Levy is a bit of an authority on the subject. It was a fascinating session and I figured I’d write a quick blurb on it to get people’s take on what I took from the event. The afternoon session was held at the Neal Building on Harbour Drive – the future home of a co-location project tentatively titled Staging Ground, which the nlpost will be highlighting in a future issue for sure. St. John’s City Councillor Dave Lane, also the Executive Director for Common Ground, was the emcee of sorts (and has been a passionate supporter and participant in the local startup community). To frame the conversation, Levy talked at length about his experience with Ryerson University in Toronto. What was interesting here was Levy’s acknowledgement that businesses require supports – sometimes differing – at each stage of their growth. He talked about the ecosystem required to support entrepreneurs, the difficulty for startups to acquire seed money, the challenge for established (but new) ventures to find the capital required to grow, and the eventual issues companies experience when they succeed enough to appear on the radar of industry giants. help develop local markets for firms (in order to prevent a geographical relocation) through a leadership council – where big business has the opportunity to “get in on” a product or service on the front end rather than buying them later on anyways after the company has moved away. How much time are startups spending looking for seed money or small amounts of capital, when that time could (and should) be spent on business development? The next stumbling block? Helping to protect those businesses who make it big and get on the competitive radar of multi-national firms. This overview of what has worked in Toronto got me thinking about what the innovation and entrepreneurial ecosystem looks like here in Newfoundland and Labrador. Where are our support gaps? Where are we letting our entrepreneurs down? We have a wide variety of funding agents, but to what degree can startups access them? How much time are startups spending looking for seed money or small amounts of capital, when that time could (and should) be spent on business development? Levy offered a refreshing outlook on the role of government, contending it is not government’s role to create the innovation and entrepreneurship system. Entrepreneurs and growing businesses have to own the movement, and thus need to drive the movement. Looking for government to lead the cause was a pathway to failure. Governments don’t create markets. Governments don’t promote your businesses and develop their strategies. It is up to the entrepreneur to do what they do best – create. While governments should not be looked upon to be the driver, they can be viewed as an important partner. They can play a significant role in helping to establish the infrastructure required, and they can help enable startups by removing barriers. In that respect, Levy suggests that the expenditures involved in developing that infrastructure and providing those supports are incredible investments for governments to make. He showed a slide which outlined the success of DMZ from 2010 to present: 2,500 jobs, 300 startups, and 1,700 innovators. Given these results, and the public investment required to help make it happen, he called it the least expensive job creator there’s ever been. Comparing it to the cost of traditional investment attraction activities for big industry on a per-job basis, there was an enormous value per-public dollar spent achieved. 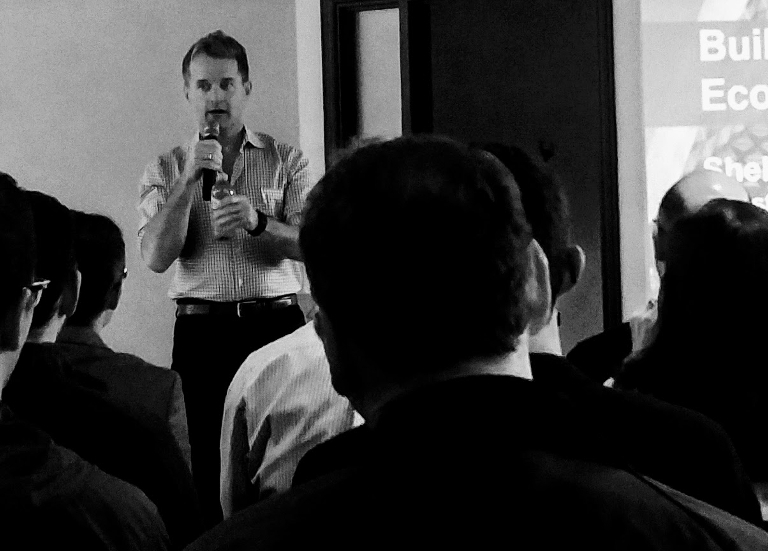 Levy also noted that government procurement can be a powerful tool to support the startup community. Governments purchase many items, and the rules on how decisions are made can be crafted to give advantages to local young companies. He used Ontario’s health department as an example, noting the department has a procurement strategy in place to help drive innovation and product development within Canada and a dedicated resource to connect health care needs with the startup community. Interesting to note here is our provincial government’s commitment to introducing new procurement legislation this Fall. An opportunity on the horizon? Another topic that arose was what was referred to at the session as “community benefit funds”. This was the mechanism by which Ryerson Futures could attract investment in order to provide the seed money to its startups – and purchase a 5% stake in return. The community benefit fund allowed investors, individuals like you and me with our RRSP’s and other programs, to invest instead in businesses at the community level at an expected rate of return and some tax credits to boot. Why invest through your bank (and therefore in international markets) when you can still make some bucks while contributing to your community at the same time? The community benefit fund allowed investors, individuals like you and me with our RRSP’s and other programs, to invest instead in businesses at the community level at an expected rate of return and some tax credits to boot. In Nova Scotia this mechanism is referred to as a “Community Economic Development Investment Fund”, or CEDIF. CEDIFs were the subject of one of our first articles, and provide all sorts of opportunities for investment in people, business, and place on the community scale. Though in that article the manner in which Ryerson Futures uses the mechanism was not considered, the statement remains: at least having this option open to people is an important enabler. Unfortunately, no such mechanism exists in Newfoundland and Labrador. I assume various regulatory and legislative changes would have to take place in order to allow for them, but perhaps we can start the work involved to open those doors, remove that barrier, and enable those who could maybe make a real difference through their deployment. Incubation as a tool for immigration – a world class business support network can attract – and retain – entrepreneurs from all over the world. Take a holistic view – building innovation and entrepreneurship ecosystems are community plans – not simply startup plans or university plans. The infrastructure should be everybody’s to mine, and who gets the credit shouldn’t be a concern. Talent isn’t going to sit around and wait – comparing ‘talent’ to minerals which stay in the ground and increase in value until the day you mine them, Levy says that talent will move where the opportunities present themselves and is a limited-time resource. Fail quickly – Levy says a key for continued growth is the idea that if you’re not going to be successful in your venture, fail quickly. You then become the talent which other, more successful enterprises, require. What’s with the big tarp on Water Street East? – Levy had a good chuckle at a big pile of salt occupying prime real estate on our waterfront. This was in response to a question about how municipalities can support the ecosystem. Municipalities must be startup friendly, and be ‘cool’ enough to attract and retain the creative individuals who become entrepreneurs. “Don’t worry about the colour of the flowers, worry about the weeds” – This was a hint by Levy that focusing on the barriers to business growth was a more productive exercise than worrying about a crowded support ecosystem. 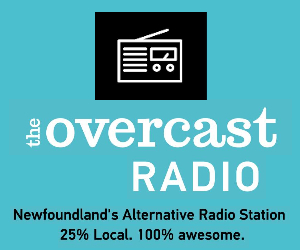 “Build small, build noisy, build energy” – however Newfoundland and Labrador goes about pursuing (or continuing to pursue) the development of the entrepreneurship ecosystem, make sure it’s at the appropriate scale and is exciting and ‘cool’ for young entrepreneurs to be a part of. Were you at the session? What were your takeaways? Even if you weren’t in attendance, let us know what you think can be done to support innovation and entrepreneurship in Newfoundland and Labrador. 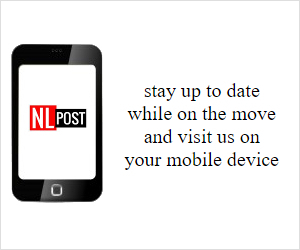 > Follow us on twitter @nlpostmag to keep tabs on our latest articles.